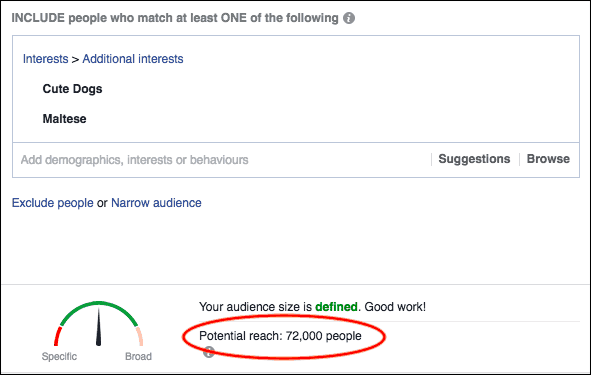 The most surefire way these days to reach your ideal audience is by using Facebook advertising. It’s not as hard as you might think. In the past, if you wanted to advertise yourself or your product, you had a few choices, and none of them were cheap. You could either buy an advert in the newspaper, on TV, on radio, or on a billboard. They were expensive and you never knew if you were reaching your ideal audience. In other words, to use a technical marketing phrase, it was “a crapshoot”. But now we have this magical wondrous thing called “the Internet” and in particular Google and Facebook. Google and Facebook are responsible for probably about 90% of the adverts you see online. 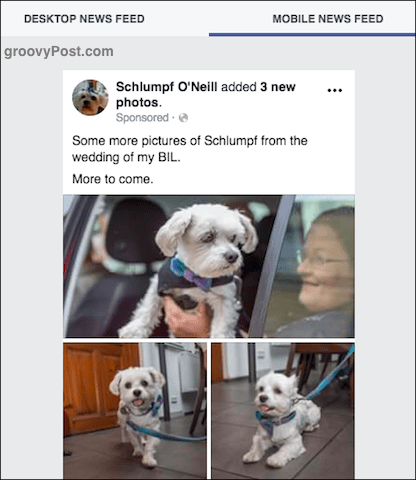 Other companies have a tiny slice of the advertising pie but Facebook advertising simply can’t be beat. Many people understandably get scared when it comes to using their credit card online. They have apocalyptic visions of some unaccountable Internet giant billing their card for millions of dollars. But in the case of Facebook, I am here to put your mind at ease. You can set a strict limit on how much Facebook can take from you. Once you hit your limit, the advert stops and so does the billing. 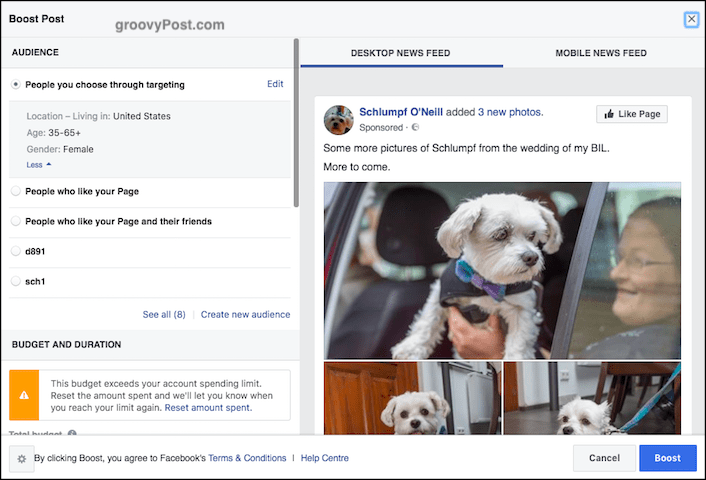 As a fiction author, I have been experimenting with Facebook advertising for over a year now and this is how I normally set up my adverts. But first it is important to distinguish between two certain types of advert – boosting and non-boosting. 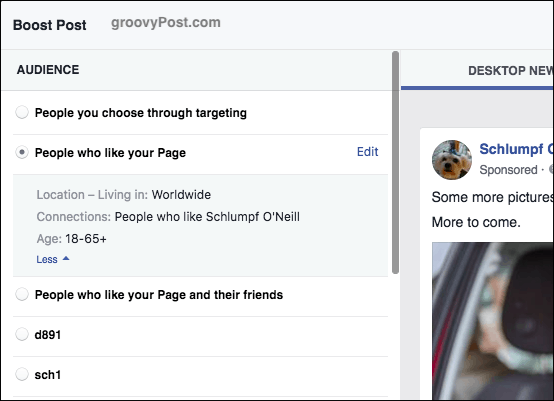 Put quite simply, boosting is the simplest form of advertising on Facebook because it takes a status update already in existence and give you the chance to expand its online reach to more people. 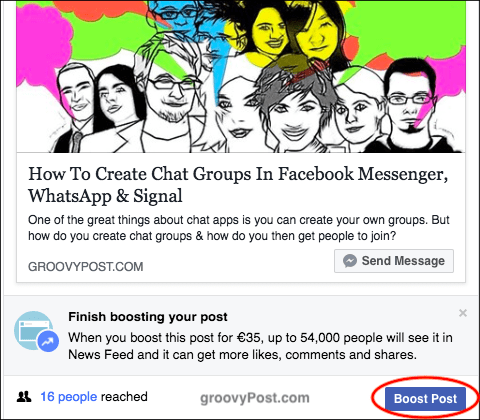 A non-boosted advert is when you make a brand-new advert (for say your great new product you want to promote) and put it on Facebook. This method is much more involved and therefore will be covered in a future article. I think the best method is to understand the boosting method first before you start getting involved in more complex stuff. During your social media travels, you may have come across this when visiting a Facebook page. 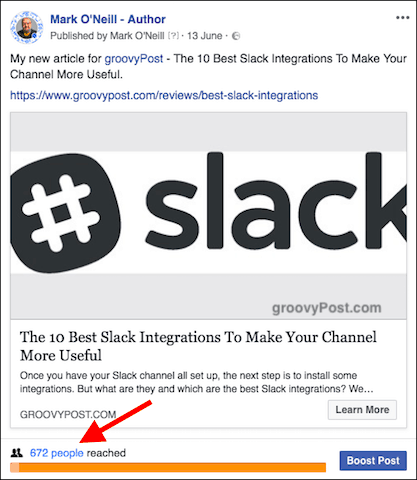 It used to be that you could post something on your Facebook page and everyone subscribed to that page would see it. But probably one morning, Mark Zuckerberg decided he would like a few extra billion dollars as ‘playing around’ money. So he tweaked the Facebook algorithm and invented something called “Boost Your Post.” Nice one Zuck. This means that now, if you don’t boost your post, only a select few will see it. I have 149 fans on my page right now and only 16 of them saw that post. If I want the others to see it – and other people not subscribed to my page – I have to open up my wallet and pay for the privilege. Yes, I have to pay to talk to my existing subscribers! So, out of principle I don’t “boost” very often. Only when there is a post I really want people to see. 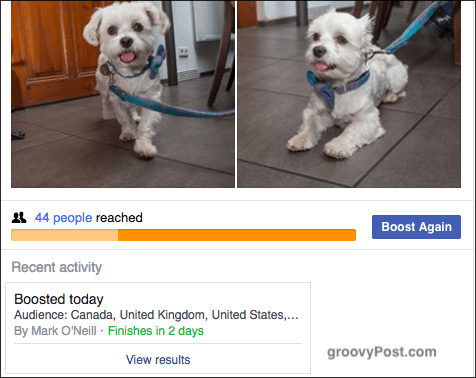 Recently I experimented with a groovyPost article and a 2-day boost got me this. Total cost? Less than $10. Basically the same amount you would spend at Starbucks buying overpriced pretentious coffee. If you look in the first screenshot, you will see the following claim by Facebook. 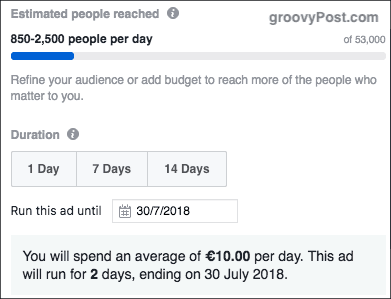 When you boost this post for €35, up to 54,000 people will see it in News Feed and it can get more likes, comments and shares. Now it’s necessary to bear a few things in mind here when reading that. 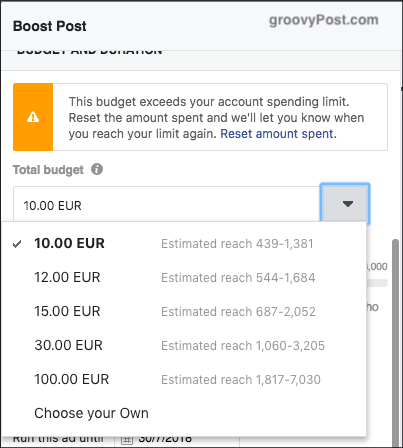 For obvious reasons, Facebook is going to push you to spend as much as possible, so it is going to suggest something like €35/$35. If you decide to spend less, then fewer people will see your ad. For the Slack article, I did a 2-day boost at $5 a day and only got 672 clicks through to the article. How many people see the ad will depend on how long you run the ad and how much you spread that $35 out (or however much you choose to spend). 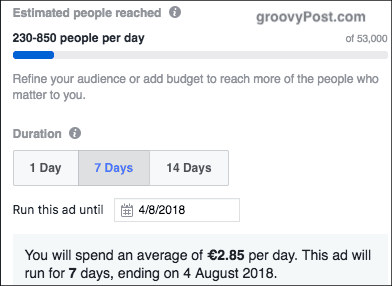 So if you do a 2-day ad for $17.50 a day, that’s good. 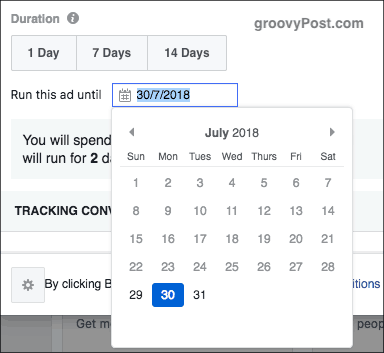 If you run a 7-day ad for $5 a day, not so good. $5 a day is not going to make you a VIP customer in Facebook’s eyes so your ad will barely get run. Another factor in deciding how many people will see it is how you target your ad. As in what demographic, what geographical location, etc. If you compete in a crowded space, you will get drowned out. More on that in a minute. Likes, comments, and shares are not guaranteed. I often see people complaining that they boosted their posts and got no likes, comments, and shares back. People are not obligated to do anything for you, just because you are paying Facebook. I also do a Facebook page for my dog because he is a dog with an ego. So let’s take a post from his page and boost it to get a few more eyeballs on it. Maybe he can finally get that modeling contract and start working for his room and board. On the right is how the post would look when presented to people who see your post in their timelines. If there is any aspect of it you don’t like, cancel the boost process, go to the post, and make the necessary changes. Then come back. Also, click on mobile news feed to make sure it looks fine on a mobile phone screen. Sometimes words get cut off because of the limited screen space. But as you can see, here it looks fine. On the left is where you start to specify who your ideal audience is. There are three options as you can see. 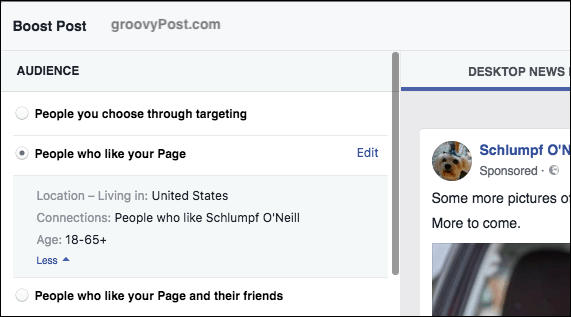 People who like your page, those people and their friends, or specific “people you choose through targeting.” I’m starting to sound like a hitman. 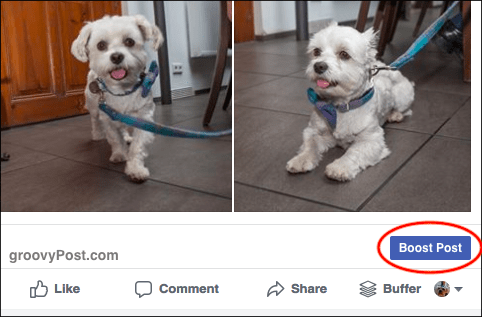 Let’s assume for a moment that you merely want your page followers to see the post. Then it is a case of clicking the Edit button and specifying which followers you want. Do you want only your page followers in a particular country? Or everyone, regardless of location? If the latter, then choose “worldwide” from the drop-down list. 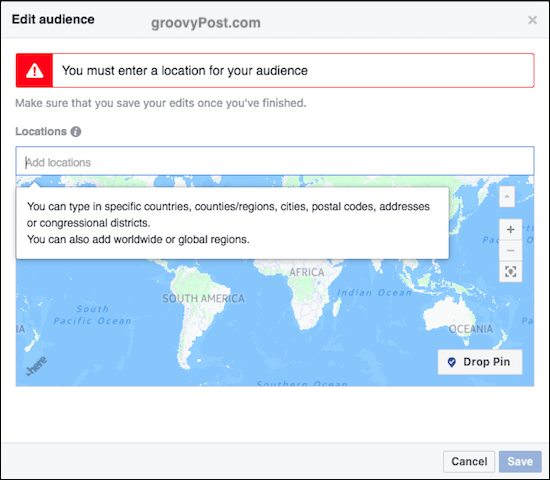 When you save that and come out, you will now see that people who like your page “worldwide” will now see your Facebook post. By the way, ignore the “d891” and “sch1” options. They are just personal campaigns I did in the past (you can save campaigns to reuse in the future). But what if you want to go outside your page followers to try and get new followers and/or customers? 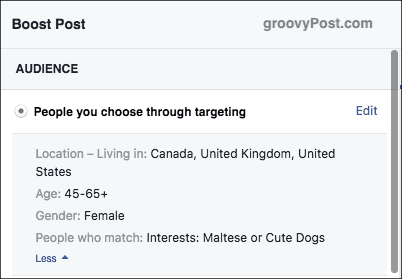 Then you need to choose the first option: “People You Choose Through Targeting.” This is where you have to first analyze your ideal audience in terms of geographical location, age, gender, interests, and more. Put a lot of effort into this part as it can make or break a campaign. If you look above, you will see that you first have to choose which countries you want. You can also remove countries you don’t want. 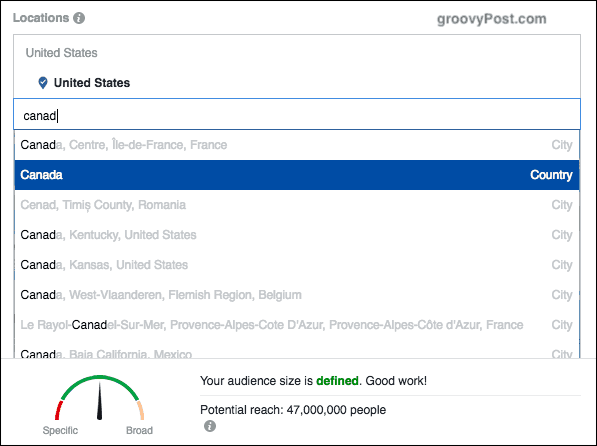 As you add and remove countries, you will see at the bottom your “potential reach.” It either has to be “specific” (the best) or “defined” (the next best). Do not let it get into “broad”. To get it specific or defined, the number of people has to go down until you have a very narrowly targeted audience. What is better? Loads of people who might be mildly interested or a smaller group of people who are extremely interested? So I added the UK, US, and Canada, and got 47 million people. That’s too many. I have to slim that figure down a bit. So let’s add interests. As you can see above, start thinking about what people would search for on Facebook if they would be interested in your status updates. So I started with “Dogs.” But that is an incredibly broad subject. How many dog breeds do we have? How many rappers are there named Dogg? Time to get even more specific. 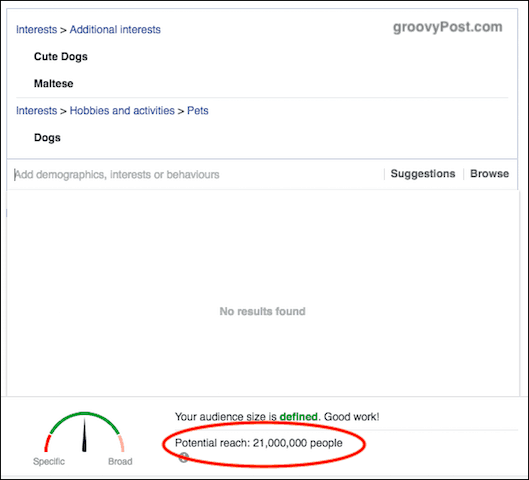 By specifying “cute dogs” and “Maltese” (my dog’s breed), I got it down from 47 million to 21 million. That’s good. But still, there’s room for improvement. So let’s look at what happens if I remove the very broad “Dogs” category. The “potential reach” suddenly drops from 21 million to 72,000! Wouldn’t you say that was more defined? Instead of just dogs, you are specifying cute Maltese dogs instead. Sorry, Rottweilers. You also have to choose your gender and your age group. So for small cute dogs, I figured my ideal audience were females from 45 years old upwards. I just don’t see any 20-something men wanting to look at cute dog pictures. I may be wrong but I am just playing the odds. Now the part Facebook enjoys the most. Finding out how much you want to pay. When you drop down the menu, you will see various amounts along with projected views for that amount. I chose 20 Euros (about $25). Yours, of course, will be in your own local currency. 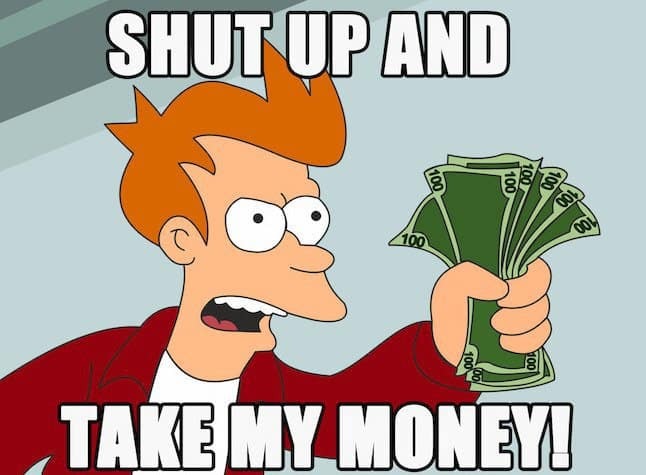 Remember, Facebook cannot charge you any more than you have agreed to pay beforehand. So don’t have any nightmares of horrendous bills coming in. Now you need to decide how long you want the ad to run for. Remember how I said that if you did a long campaign and spread out your money very thinly, your ad would suffer? Well here is the proof. When I chose two days at EUR 10 a day, it told me I would get up to 2,500 people a day. At the very least, 850. Not too shabby I guess. But now look what happens if I run a 7-day campaign at EUR 2.85 a day. Suddenly 850 is the best I can hope to get – if I’m lucky. I put it back to 2 days. If you are just starting out, I would ignore the Facebook pixel option. It’s only for when you are trying to send people to your website, and you need to see how well your ad is performing. It is rather outside the scope of this article. You will be asked for payment details. Credit card or Paypal can be used. You are billed either when your spending limit is reached or when your ad is finished. Whichever comes first. 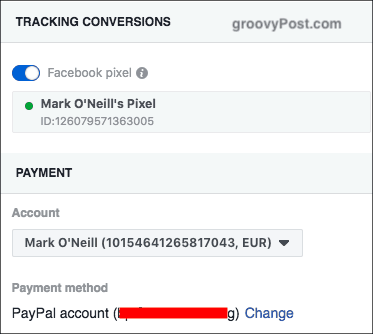 Sometimes your spending limit is not remotely reached by Facebook. That, in a nutshell, is how to boost a post. Results are not guaranteed immediately. It may take several hours (or even 24 hours) to notice any initial results. But you can at any time go into the ad settings and tweak things if you think you are not doing things right. But try not to cancel the ad prematurely. It’s easy to take fright and cancel it. After 20 minutes, I already have 44 clicks. You will likely mess up at first, but like everything else in life, you have to keep experimenting. You have to test. Over and over again. When you finally have it right, then bottle the winning formula and reuse.